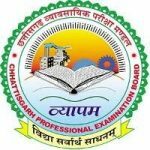 CG Vyapam Patwari Recruitment 2019: The Chhattisgarh Professional Exam Board is inviting candidates to Apply online for the CG Vyapam Patwari recruitment 2019. All interested candidates are requested to send in their filled CG Vyapam Patwari Online Application Form on the official website of the CGPEB before the last date on 31st January 2019. The CG Vyapam Patwari recruitment is an excellent opportunity for all the candidates who are seeking a government job in Chhattisgarh. Targeted at all candidates who satisfy the eligibility criteria put forward by the CGPEB, the Patwari recruitment hopes to hire 250 capable candidates for this post. This is also your golden opportunity to get yourself a government job is you are a seeking a government job after 12th pass. This is because all candidates who have completed their 12th pass are deemed eligible by the CG Vyapam. Further details regarding the education qualification have been provided below. Kindly ensure that you go through this page for all the information regarding the CG Vyapam Patwari Recruitment 2019 including all the details regarding the Patwari Salary Scale, CG Vyapam Patwari recruitment important dates, and eligibility criteria. Don’t miss out on this amazing opportunity as government jobs in Chhattisgarh are highly sought after. This is your opportunity to set up the foundation for a long and successful career in the Chhattisgarh State Government. Candidates are notified that the category wise age relaxation police will be based on the regulations of the Chhattisgarh Govt. Make sure that you go through the official website of CG Vyapam and also the official CG Vyapam Patwari Recruitment Notification PDF in order for all the latest details. According to the official notification, there will be age relaxation available to eligible candidates. But the age limit cannot be beyond 45 years under any circumstances. Candidates also need to have completed their Computer Course from a recognized institute. One year Computer Programming Diploma Course. Candidates will be eligible for selection after they pass in the CG Vyapam Patwari Written Exam 2019. the Written exam is set to be conducted on 11th March 2019. The Examination fee is to be submitted online by visiting the official website @ cgvyapam.choice.gov.in. The fee can be paid through debit card/credit card/net banking- IMPS. CG Vayapam has ensured that candidates who are applying for this post are attracted by the handsome salary structure that they have provided for this recruitment. 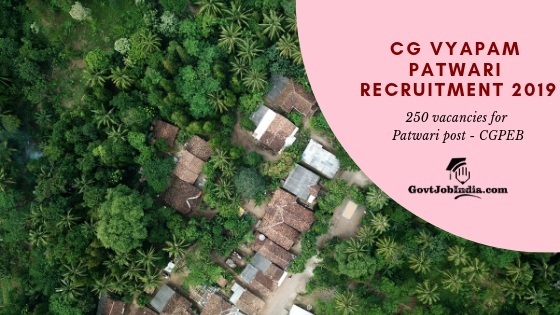 Check out the CG Vayapam Patwari Salary 2019 below. How to apply for CG Vyapam Patwari Recruitment 2019 Online? Candidates who are new to the post will have to first register on the official website @ cgvyapam.choice.gov.in. The registration option is available on the home page of the official website. Already registered aspirants will have to use their login id and password to sign in. Once logged in, please select the re-register option to register for the post of Patwari. Once logged in, the details that the applicants hold regarding the legitimate documents have to be submitted. After submitting the document details, pay the examination fee and proceed to fill in the online application. When done with filling the application, please click the submit button. If there are difficulties in proceeding with the application form, please click the instruction option available on the website. It will provide a step by step guide to fill in the application form and complete all the formalities. Please be careful while submitting the photograph and the signature as well. The photograph to be provided shall be recent. The signature must be clear and visible as it will be compared with all the documents that you provide and the signatures you make on the recruitment/examination formalities. Kindly note that the contact details (e-mail address and mobile number) you provide are accurate. They will be considered for any official communication from the regulatory authority. Hopefully, all the details provided here regarding the CG Vyapam Patwari Recruitment has assisted you. Make sure that you apply online for this Patwari vacancy in the Chhattisgarh government by applying online for the same before the last date on 31st January 2019. You can ask us all your doubts in the comment section below. We are always available to provide you with help. All the best!